Y'all know Mariah Carey isn't busting too much of a sweat ...ever. Folks were busy tweeting, trying to figure out if Mariah Carey was lip syncing when she hit the stage at the 2018 American Music Awards to perform her recently released single "With You." The track will be featured on her upcoming album, set to drop later this year. Donning a hot pink gown (in honor of Breast Cancer Awareness month), MiMi belted out her new track during her first AMAs performance since 2008. However, folks accused her of using a pre-recorded vocal track. Jennifer Lopez debuted her new song "Limitless," a track from her upcoming film, Second Act, during the 2018 AMAs. The performance opened with a clip from the movie before JLo began singing the tune. On the carpet, the actress/singer/dancer said she was excited to perform the single because she loves the song (which was written by SIA) so much and that it's empowering for the world right now. In Second Act, JLo plays a woman named Maya, whose lack of a college degree has left her with unfulfilled career dreams until her friends create a false identity for her, which lands her a prestigious job in New York City. Her bestie Leah Remini also stars in it. Second Act is scheduled to hit theaters December 14th. 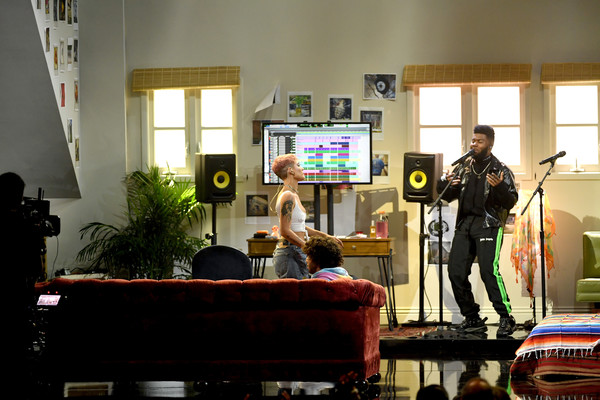 After copping the Favorite Soul/R&B Male Artist award, Khalid hit the stage alongside Benny Blanco and Halsey to perform their chart topping hit, "Eastside." The stage was transformed into a bedroom studio where the trio rocked out to their pop bop, which spent 12 weeks on the Hot 100. In case you missed, check out our red carpet coverage HERE, HERE, and HERE.